Beats by Dr. Dre Solo 2 review | What Hi-Fi? Love ’em or hate ’em, if it weren’t for the Beats brand, many of the company's headphone rivals wouldn’t exist. So here we have the Beats Solo 2s. This particular version is actually part of the ‘Royal Edition’ which adds more colourful finishes to the current line-up. The striking Sapphire Blue paint job isn’t subtle, but if you want to stand out from the crowd, it ticks that box (though more sedate options are also available). 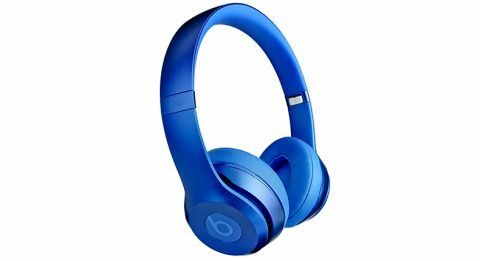 As you’d expect from portable headphones, the Beats are a lightweight design and they’re hinged, which means you can stow them away in tight spots. They come with a neoprene storage pouch which can double as a decent camera case if you’d rather keep your headphones on display. Compared with some of their rivals, the Beats feel quite cheap and plasticky. The hinges give off a loud click, and the click varies between earcups, with one slightly higher pitched than the other. The fit, though, is decent and the pressure on your ears reasonably judged. The RemoteTalk cable plugs into the left earcup through a 3.5mm jack, and it’s finished in matching Sapphire Blue rubber. The matt finish extends to the in-line mic and three-button remote (for iOS), which is tactile and easy to use. As always, only certain elements of the controls work with Android and other smartphone brands. It’s one of the nicer remotes to use and you aren’t left fumbling around when it’s time to skip track or change the volume. In our experience, Beats sound quality has been a bit hit-and-miss – and the Solo 2s continue the trend. Play Sam Smith’s I’m Not The Only One, and there’s a fine sense of slam and attack where the drum kicks are concerned. The hand-claps sound crisp and precise, and the vocals are both rich and warm. Even though there’s plenty of excitement in the music, there’s no unpleasant hardness to speak of. Still, the Beats force an upbeat, attacking sound on every track, which doesn’t lend itself well to slower, more subtle numbers. Shifts from high to low-level dynamics aren’t driven home with enough conviction. The top picks at this money, such as the B&O H2s and Philips M1MKIIs sound clearer, more exciting and deliver rhythms with more care and greater finesse. The Solo 2s do the job – the problem is that rival cans do it better for similar money.